These Scriptures form the basis for the doctrine of the Real Presence. 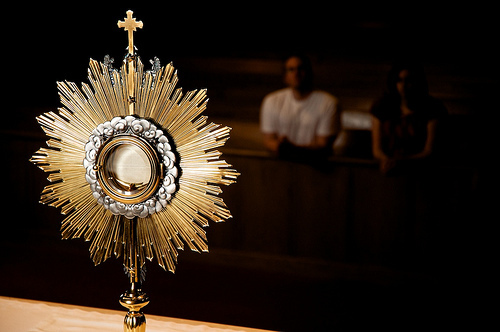 This doctrine teaches that Our Lord is really and truly present in the Holy Eucharist. This is a doctrine which he Charismatic Episcopal Church affirms when it states: “At the center of worship is the Sacrament of Holy Eucharist (Holy Communion) in which we believe is the real presence of Christ.” Transubstantiation is a Roman-Catholic attempt to rationalize and explain a miracle. Whether their explanation is right or wrong makes no bearing on the miracle itself. The miracle remains whether they explain it accurately or not. This is a preposterously high standard by which nothing may really stand under scrutiny. Everywhere? Always? By everyone? That excludes even the Nicene Creed? It was not written until 323 and not finished until 381. Even at that, Eastern and Western Christians proclaim significantly different versions of the Creed. If one holds the Vincentian Canon as the be all and end all of Catholicity, then nothing stands and those who proclaim the Nicene Creed are themselves heterodox! As the Protestant reformers specifically rejected the doctrine of the Real Presence–a doctrine found in Holy Scripture and held by both the Roman-Catholic in the West and Eastern Orthodox int he East–according to the Vincentian Canon, one might allege that it was the reformers who were teaching something apart from the Faith Catholic. This is also why the priest and other servers go to such care with the Sacraments after Holy Communion has been served. “Leftovers” are not simply tossed in the trash like stale Doritos; they are fully consumed. The Sacred Vessels are not washed in a normal sink that drains into the sewer, but in a special sink that drains into a garden. Why is this if not for the acknowledgement that it is not fitting for Our Lord to be in the trash and sewer? He may descend there on His own to rescue a sinner, but far be it from us to send Him their on our own! Treating the Blessed Sacrament with its due respect is not idolatry. Quite the contrary, it is an acknowledgement of not one but two miracles! First, the Real Presence in the Holy Eucharist acknowledges the Mystery of the Incarnation wherein, as St. John tells us, “And the Word became flesh and dwelt among us, and we beheld His glory, the glory as of the only begotten of the Father, full of grace and truth.” (1:14) Secondly, venerating the Blessed Sacrament acknowledges that Our Lord not only became flesh, but gave us His flesh perpetually through the Holy Eucharist. We are not, like some, left to live our lives with one experience with the Divine. We have the opportunity to partake our our God’s very Body and Blood on a daily basis. This is not idolatry. Rather, the farthest thing from it, accepting the Real Presence of Jesus Christ in the Eucharist, is celebrating, yes, even reveling in the glorious deeds of Christ wrought on our behalf! What of the Christian who is unable to partake of the Sacrament on a given day? What if they are prevented from finding him against whom they hold aught and repenting, as Our Lord suggests? 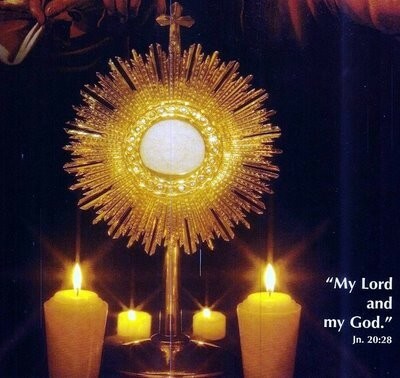 (St. Matthew 5:23-25) Should they leave their church lest they behold the Blessed Sacrament without consuming Him? Do they gain nothing from being there at the consecration when they do not receive? Of course, they most certainly do, whether they consume the Body and Blood of Jesus or not! There is a grace of being present among the believers and among the Real Presence in recalling the saving work God did for us. Most certainly, there are Christian who abuse this gift. Some, no doubt, begin to think of the wafer not as the presence of God, but as God Himself. Surely this is “putting God in a box,” or a monstrance, as the case may be. But this is not what the faithful are taught. They are taught to behold the presence of God and marvel at the inconceivable love required that God who is universally powerful would condescend to inhabit some miniscule wafer on our behalf. They are taught to sit in awe and contemplate a Divinity who would give His own flesh to be consumed by those who despised Him at His death. They are taught that when face to face with the humility of the God who would do all this for us, the only proper response is… Adoration. 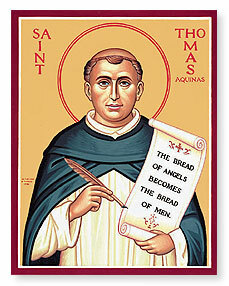 Today we commemorate the life and ministry of Saint Thomas Aquinas. One could—and many have—filled whole libraries with analyses, commentaries, and reviews of the works the Angelic Doctor, whose own works alone go a long way towards starting a library. A few weeks ago I flippantly declared that “I don’t believe in theology.” You would have thought I disowned Christ. Though a priest, I despise the work of “doing” theology. Systematics is not my bag. I can talk historical theology (the study of what people believed at a certain time), church history, Biblical studies, and the like, but do not ask me to get theological. I don’t do it. So it would make sense that I have no intent at all to comment on Saint Thomas Aquinas’ Summa Theologica (his magnum opus and humbly named Summary of All Theology). Instead, I prefer to focus on the good doctor’s ardent and passionate devotion to Our Lord Jesus Christ in the Holy Eucharist. Aside from being one of the greatest theological minds of the last half a millennia (so I’ve been told), St. Thomas Aquinas composed an entire Mass setting for the Feast of Corpus Christi. That is the day on which the Church gives thanks for the Real Presence of Our Lord Jesus Christ in the Holy Eucharist. To go along with this service, the saint composed a set of hymns which I find to be some of the most beautiful hymns ever written. I choose to focus on these this day. In the glorious vision, blessed Lord, of thee. Makes our inward vision clear. Who from Both with Both is One. Amen. Almighty God, you have enriched your Church with the singular learning and holiness of your servant Thomas Aquinas; enlighten us more and more, we pray, by the disciplined thinking and teaching of Christian scholars, and deepen our devotion by the example of saintly lives; through Jesus Christ our Lord, who lives and reigns with you and the Holy Spirit, one God, forever and ever.